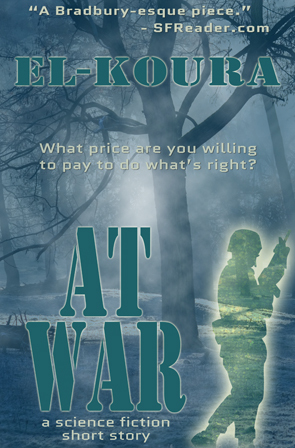 Stationed in a forest to guard a bridge that probably isn’t even on the enemy’s radar, Private Arthur Ritley discovers that his partner is leaving camp without authorization for long stretches of time. But, in this forest in the middle of nothing, where is there to go? The answer to that question will shock Private Ritley. Will he turn his partner in, or be a silent accessory? Or will he accompany his partner on these excursions? And what happens when the rest of the camp discovers his partner’s secret? Not only his integrity, but Private Ritley’s very life, is put in jeopardy in this science fiction short story that asks questions about who we are, what we believe, and what price we’re willing to pay for those beliefs.